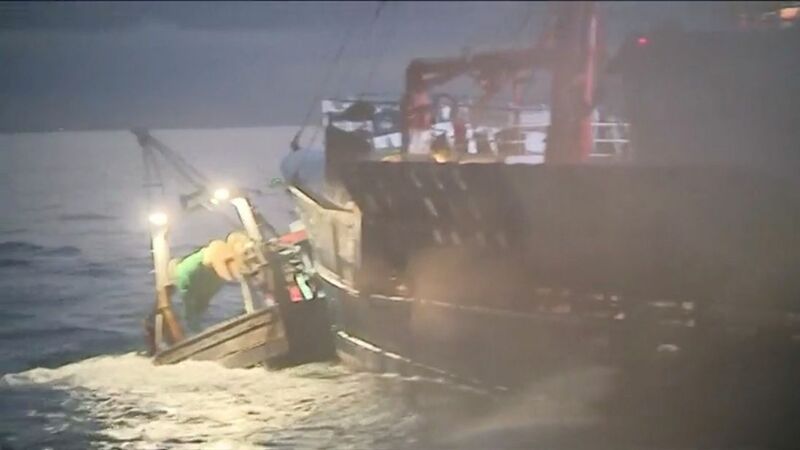 British and French fishermen have failed to reach a deal to end the scallop wars in the English Channel. Talks broke down in Paris on Friday, with industry bosses unsuccessful in an attempt to agree a compensation package that would address recent skirmishes. Tensions rose last week when five British vessels sparred with dozens of French boats in the Seine Bay - with footage showing fishermen from both sides ramming each other. On Wednesday, smaller British vessels had pledged not to fish in the area from 15 May to 1 October. Under laws set in Paris, French fishermen are banned from taking scallops during this period in order to conserve stocks. However, this agreement was on the basis that UK fishermen would not lose out financially - and the price appears to have been too high for the French during the latest talks. British ships are legally allowed to forage in the disputed territory all year round - but an industry accord prevents UK vessels larger than 15m (50ft) from doing so. Further talks could now be held next week, according to a Department for Environment, Food and Rural Affairs (DEFRA) spokeswoman. She said: "We are making progress... discussions are continuing and we are looking at next steps." Derek Meredith, the owner of South West Trawlers, called the compensation offered for keeping out of the area "an insult". "The English boats have lost thousands of pounds now," he told Sky News. "For nothing in return, as expected. "I think the British government needs to make sure we get compensation. We have been forced out of the area, we've been assaulted and it's not good enough."